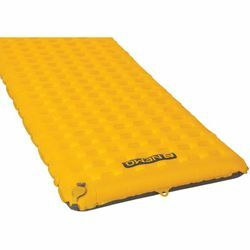 NEMO Tensor Insulated Ultralight Sleeping Pad. Offering quieter, more supportive sleep at a tiny packed size, Tensor™ ultralight sleeping pad stands apart as the ultimate backcountry adventurer’s best friend. Updated with a zero-profile, micro-adjustable valve and included Vortex™ pump sack, NEMO's lightest sleeping pad uses premium 20D fabrics to shave grams without sacrificing plush comfort. Remarkably quiet sleep as compared with other sleeping pads due to suspended film construction. No loud crinkly noise when shifting in the night.